The new era of peace was not to come. That same spring, his Cairo speech with its abandonment of American power and alliances would devolve the Middle East into murderous civil wars fought over lines of tribe and Islamist regimes rejecting common humanity with non-Muslims and even fellow Muslims. In Iraq, as in Ukraine and Syria, the lines of tribe held and common humanity was nowhere in sight. The denunciations of cultural appropriation never work in reverse. No one is going to complain when Egyptian writers plagiarize French novels or half the world churns out even worse imitations of truly terrible American pop music. Katy Perry wearing a Kimono is a hate crime, but the Rockabilly dancers in leather jackets and poodle skirts twirling in Toyko’s Harajuku Park aren’t going to face condemnation. It is particularly ironic that Jarrar, a woman from a culture which comfortably pilfered math from the Indians, religion from the Jews and science from the Greeks is insisting that belly dancing should be the private property of her culture. If every culture that contributed to the Arab world got to call in its chits the same way, Randa Jarrar and her compatriots wouldn’t have a whole lot left except belly dancing. And maybe not even that. It is entirely possible that belly dancing actually originated in India. In that case, it’s Randa Jarrar who is the cultural appropriationist. I did an interview with Jamie Glazov on the Glazov Gang last week and you can catch it here. False hate crimes are alleged in order to cause fear of violence in the minds of minorities. That means they are not "false" hate crimes, they are quite intentional hate crimes. They are intended to terrorize an ethnic, racial or gender group, and they clearly do that. It may be that the perpetrators of these "false" hate crimes hope the ULTIMATE outcome will be positive (i.e. 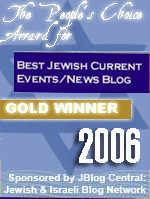 more rallies, greater hate crime penalties, more white guilt, more hetero shame, etc.) but they are achieving those goals by terroristic means--not by terrorizing the "guilty" people (i..e. whites, Christians, heaters) but by terrorizing the very minorities they say they love. They should be punished for terrorism/hate. Whatever their ultimate goals are should not matter. There’s nothing like a lesbian feminist authority figure who boasts of being the first female police chief in Minneapolis donning a symbol of male ownership in a patriarchal tribal society to express the deep schizophrenia of the left in its enthusiastic enabling of Islamists. Warmists claim that they can predict that the world will end because too many people drive to work, yet they’re caught by surprise every time there’s a blizzard. Mr Crow, who was interviewed over a three-course lunch at Westminster’s fashionable Inn the Park restaurant, claimed to be a ‘communist socialist’ who believed in ‘a society that is based on need rather than greed’. He argued that if he did move he would be seen as having deserted his working class roots. “If I moved out of my house tomorrow the first thing you’d say is Comrade Crow leaves his roots,” he said. Islam is on a mission to outlaw every single thing in existence… except murdering people in its name. Women have been banned from swimming in the ocean, a fatwa hit was put out on Mickey Mouse and emoticons were banned. So the only thing left to do was ban “all you can eat” buffets. “Whoever enters the buffet and eats for 10 or 50 riyals without deciding the quantity they will eat is violating Sharia (Islamic) law,” said Fawzan. Congresswoman Sheila Jackson Lee, who somehow has a B.A. in Political Science from Yale University and then went on to graduate from law school at the University of Virginia, not only doesn’t know when the United States Constitution was written, but can’t even name the right century. Red-baiting was one of the more fantastic inventions of the left. Suddenly pointing out that someone was a member of a mass murdering ideology bent on world conquest… was worse than actually being a member of that ideology. Red-baiting was tacky, hateful and everything that enlightened people didn’t want to be. It was perfectly all-right for a Communist to say he was one. It was alright for an admiring fellow traveler to say it. But not for anyone who thought that mass enslavement and murder under the red flag were bad things. Red-baiting gave the Marxists and Communists immunity from criticism. Questioning their politics had become worse than their actual politics. The only nurses who see a new medical facility going up as an assault on patients ought to be hospitalized themselves. But that didn’t stop SEIU, Jill, the NAACP and assorted lefties from making fools of themselves by protesting a hospital wing. They didn’t have demands so much as self-righteous chants. If the whole thing resembles an addled cult going about some strange ceremony, that’s because that is what it was. A lot of city dwellers look up from a front page story about three people dead in a gang shooting and have trouble believing that the answer is less gun laws. That doesn’t mean they’re right, but it does mean that they need to be educated. Most of the country still supports the 2nd Amendment, but support is notoriously weak in many cities. African-Americans tend to support gun control in large numbers. This is an emotional attitude that comes from life experience. It has to be overcome with facts, but it’s hard to convince people who have lived a certain way that their life experience isn’t valid. Both of these are reasons to reach out to Carson. He doesn’t appear to have his mind firmly made up and is still grappling with the issue. "The left careens from this oppressed group or crisis moment to that one, from one magical or morally pristine constituency or source of political agency (youth/students; undocumented immigrants; the Iraqi labor movement; the Zapatistas; the urban “precariat”; green whatever; the black/Latino/LGBT “community”; the grassroots, the netroots, and the blogosphere; this season’s worthless Democrat; Occupy; a “Trotskyist” software engineer elected to the Seattle City Council) to another…"
You might assume that at least the death of Nelson Mandela would not be about Israel. But this is the Washington Report on Middle East Affairs. If it’s not about Israel, it’s not in the magazine. So the Washington Report on Middle East Affairs publishes two articles on Mandela by Palestinian Arabs who talk about how evil Israel is. One of them is Marwan Barghouti whom the Washington Report on Middle East Affairs describes as the “Palestinian Mandela” who is in prison for running a terrorist group responsible for numerous murders, including that of a Greek Orthodox monk. WHAT IS RALPH NADER DOING THESE DAYS? Ralph Nader spent two days counting the cars turning illegally onto Connecticut Avenue NW so he could complain to city officials about poorly positioned “No Left Turn” signs. I was in the Air Police, charged with guarding the base and its B52 bombers, KC135 tankers, and U2 spy planes. Larson was also an ICBM base, but the silos had separate security. One evening, after a regular 8-hour shift on the flight line, I was one of about eight other air cops selected to serve on a backup or reserve team. This meant that we could sack out in the reserve team's quarters, play cards, read a book, or indulge, as a group, armed with our carbines and sidearms, in some other diversion. On my first night on the team it was decided to go to the base movie theater, to which we were admitted free. "Dr. Strangelove" was playing. As we sat in a back row behind the audience, the movie thoroughly confused me. My colleagues thought it was hilarious, especially when the motto, "Peace is Our Profession" was prominently juxtaposed with the noisy battle scenes between Army troops and Air Force base policemen. That was my introduction to how the Left depicted the country and America. Director Stanley Kubrick, I learned later, was not so much a "leftist" as disturbed, obsessed with madness and irony and what he perceived as the ignoble baseness of man. But, that evening marked the beginning of an intellectual journey to investigate and report on what was so wrong with the country that its artists and novelists and filmmakers could so freely paint it in such disparaging and malicious colors with impunity. Were these people sociopaths? Or psychopaths? Was there a difference between the pathologies? Could an ideology inculcate a destructive pathology in a person, or are the pathologically-inclined inexorably drawn to a destructive ideology? "Third-grader Jazmien Sparks, center, 9, holds her head in her hands as she listens to US Rep. Dan Kildee, D-Flint Twp., as he announces plans to introduce a comprehensive legislative package in Congress to help reduce violent crime on Feb. 19 at Pierce Creative Arts Elementary School in Flint, Mich."
You have to wonder about a school, a teacher, and a politician who collude in exposing 9 year olds to such a tendentious spewing of half-baked blather. What possible interest would a 9 year old have in such an abstract chunk of political preening? The 9-year-old girl doesn't, but she's just there to be used as a political prop. Democrats don't talk to people, they talk at them, whether they're 9 or 90. People who have Democratic politicians inflicted on them are to serve as unpaid extras with a walk on role of either pretending to pay attention or gasp in admiration. It's not their show, it's his show. It's not our country, it's their country. We're just props for the latest initiative to subsidize transgender wheelchair Olympics to boost self-esteem in drunken nomads who will spin windmills to generate Green Energy for inner city neighborhoods. The whole country is a stage on which the same old gang performs its cowboy poetry of rustling taxpayer money and then goes home to admire itself in a mirror. The little girl is just fitting into her role as taxpayer and political prop. But that’s because the GOP spin machine, much like the progressive mainstream press (the two are becoming comfortable using the same playbook, incidentally), understands, as do Democrat operatives, that if ObamaCare doesn’t harm enough people before the next major election cycles, people may believe the whole thing rather innocuous. Which means they may continue voting along their traditional patterns — with any offset of those who have awakened to the political reality that we live in essentially a one-party aristocratic statist monolith made up for by an increase in imported “pre-citizens” (and in Chicago, post-citizens, many covered in dirt), who we’ll allow to vote, numerous times in some instances, without ID and without any desire to assimilate. People from all walks of life gathered around the Balkans Monday to commemorate International Holocaust Remembrance Day and reflect on their own personal losses. Thousands gathered in front of Bosnia’s Cathedral of the Sacred Heart to raise placards emblazoned with slogans such as “Nationalism kills,” written in Bosnian, Serbian and Croatian. Sam Adams Brewing Co. just pulled its' sponsorship of the St Pat's parade in Boston. The organizers of the parade refused to allow a gay group to march as a gay group. Recently, Diblahblah refused to march in the NYC parade as well, for the same reason.. Considering how many first responders in both cities are of Irish heritage, and proud of it, this seems rather boneheaded of both Sam Adams and the mayor. As a second generation Irishwoman, I have little doubt that gays have always been in the parades, but as part of Irish clubs and groups. No objections have been reported to that, to my knowledge.. It seems that of late, certain groups want not just equality, which in fact, they have had for a long time, but they want 'extra' rights and special privileges which are beyond the scope of many traditional American activities, especially those that include children.. It is becoming silly and self serving, but pc'ness keeps people of common sense mute. What's next, abortion activists wearing green Pro Choice t.shirts joining the fun? I'm disinclined to beat up on Obama over the failure of the Arab Spring. All those Arab dictators were well past their sell-by dates, and their countries would have blown up no matter who was President. The same violent upheavals followed by dictatorships followed by violent upheavals etc. have been going on since independence. 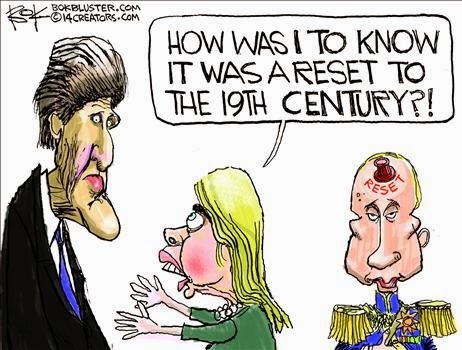 "How was I to know that it was a reset to the 19th century?" Hillary in the cartoon asks. She just as well might've asked: "How was I to know anything about the 19th or 20th centuries except during Bill's time in the White House, and my time as Secretary of State? What do you think I am? Some sort of well-read person or something?" And she asks that to John Kerry's clueless face. His index finger is still hurting from pressing the reset button on Putin's cranium. I watched the video and in my eyes you are indeed one of the five most intelligent people I've known. 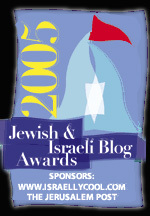 Also, even though you're not a rav many of your articles read like dvar Torah. You are blessed and a blessing to others.